I filed a brief report on Tinpot Hut in 2011, after meeting up with Owner/Winemaker Fiona Turner (right) to taste her wines whilst I was in New Zealand on an extensive tour. 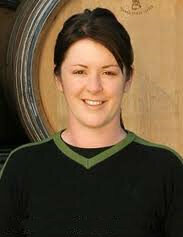 Launched in 2006, Tinpot Hut is Fiona’s solo venture having collaborated for a number of years with winemaker Matt Thomson in the production of some of New Zealand’s most highly-regarded wines. The name Tinpot Hut is derived from the old sheep mustering huts in the remote hills of the Marlborough region. Fiona uses fruit from her own vineyards at Blind River in the Awatere Valley, but also sources fruit from other vineyards and indeed from other regions for some of her wines. A new wine in the 2012 line-up for me is the Riesling, which comes exclusively from her own vineyards. It’s a wine in the Kabinett style that Marlborough does so well, with some residual sugar and low alcohol. These 2012s benefit from a vintage characterised by a cooler spring that led to lower yields than normal into a ripening season that was also cool and dry. With no mildew or rot, harvests could be a little later than normal giving a chance to capture slightly richer, more concentrated flavours. Tinpot Hut is jointly owned by Fiona and Matt Thomson, in partnership with Liberty Wines UK, who also import their wines. 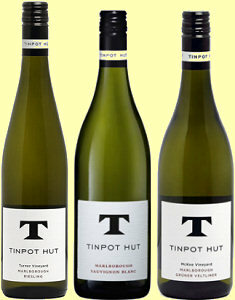 See all Tinpot Hut wines on wine-searcher. This 2012 vintage wine is fresh as a daisy of course, and delightfully sippable either as an aperitif or with fish, seafood or lighter starters. Marlborough Riesling may be hardly as well knows as their Sauvignon Blanc, but the wines, like this one, are often beautifully pitched: not as austere as most Australian examples, with fleeting impression of sweetness softening the mandarin-orange and lime freshness and crunch, but with an icy precision in the finish. Delicious and a handy 10% alcohol if you have a long day of eating and drinking ahead. 88/100. £12.65-£15.95, see all stockists on wine-searcher. A blend of Fiona’s own Blind River fruit and selected parcels from the Wairau region’s heavier silt soils. Delicious pea-shoot crunch and verve, fragrant with nuances of lemongrass and something delicately lime-like. On the palate there’s real concentration. Alcohol is 13% by volume, but it is a powerful Sauvignon with a decisively pithy acidity at its core, quite nervy and taut, with those herb flavours and dry apple-core fruit quite mouth-watering. A very nice rendition of this classic style. 90/100. £8.95-£12.49, see all stockists on wine-searcher. A single vineyard wine, the grapes grown by the McKee family in the Blind River sub-region of the Awatere Valley. Fiona concentrates on managing the sometimes harsh phenolic character of the Grüner Veltliner, including using only free-run juice in this bottling. It has a cool, gently green-herbed nose, with hints of leafy spearmint and some salty, stoney minerals. Very dry and lemon-pithy on the palate, this has a fine sense of precision and lightness, though some of the pepper and zesty freshness of the grape comes through. There’s a burgeoning sense of ripeness that never quite overcomes that pithy dryness. A wine that perhaps could have benefited from a touch more flesh on its bones, but I admire the freshness, restraint and precision. 90/100. £12.89-£15.95, see all stockists on wine-searcher.